I read it over the Christmas break last year, and mulled over several situations and it gave me some powerful insights and ideas to resolve problems and conflict. Whilst I can't provide details here, I can look back over this year at 4 or 5 situations that I think were resolved due to the application of principles I gleaned from this book. Some of them actual cases in litigation, others were team based, and others more close to home. As a Dispute Resolution lawyer, I seem to attract conflict and difficult situations ! But this book caused me to think about conflict a lot more deeply, and not just looking out at the world, but it also held up a mirror to see some realisations about myself. Whether its power struggles in a global conglomerate, tension within a community or workplace, or strained family relationships - this book will give you a fresh approach and understanding. 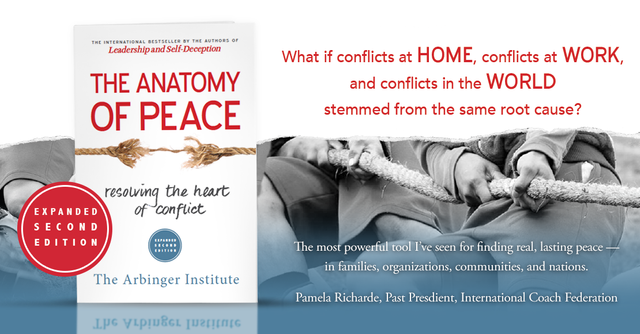 What if conflicts at home, conflicts at work, and conflicts in the world stem from the same root cause? What if we systematically misunderstand that cause? And what if, as a result, we systematically perpetuate the very problems we think we are trying to solve? Every day. From the authors of Leadership & Self-Deception comes the expanded second edition of an international bestseller that instills hope and inspires reconciliation. Through a moving story of parents who are struggling with their own children and with problems that have come to consume their lives, we learn from once-bitter enemies the way to transform personal, professional, and global conflicts, even when war is upon us.